This cocktail bar doesn’t only serve cosmos and lychee martinis. From Prohibition to Tiki, this mixologist is delivering it all. And with a 55-lable wine list available, the Mayhaw is bound to have your favorite vino on-site. Organic dietary restrictions? Derek Brumfield checks that box too, with all of his juices, syrups, modifiers, and mixers made fresh daily using in-house original recipes. Cheers! Chase Rodriguez is bringing his high-quality, craft coffee and tea beverages to Miami locals like you. But don’t expect to order your average cup of Joe. Exploring the complexities and nuances of coffee and tea through his new concept at Sabal Coffee, his menu will include espresso-based beverages, ready-brew, cold-brew, single-origin pour-overs, and both hot and iced teas too. When you think of traditional American classics, two thoughts come to mind, crispy apple pie and juicy cheeseburgers. But these three brothers think of something else—home down southern comfort food. 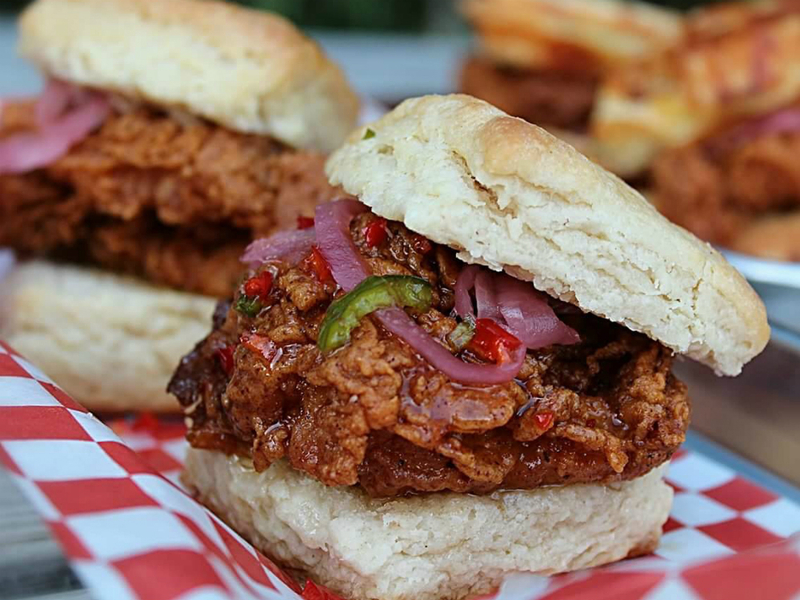 So when Robert, Ruben, and Giancarlo Rodriguez, finally wrote their thoughts on paper, they decided, lets open a country kitchen serving Miami locals home-style southern favorites. Fluffy buttermilk biscuits with candy bacon butter and 25-hour brined fried chicken served on a cheddar chive waffle with house-pickled onions are just to name a few. But these serious eats are so endless; you’ll be falling in love with more than just two. From churning out red carpet events for brands such as Louis Vuitton and Gucci, and A-listers including Sara Jessica Parker and Will Smith, this private chef and culinary director now decided to produce one for Miami eaters too with his new outpost, Jaffa. Featuring classics from his native Israeli culture such as turmeric-roasted cauliflower, spiced roasted carrots with labneh, and even Israeli meze, you can’t go wrong at this spot. Escaping Peru’s struggling economy, this Chinese Peruvian chef relocated to Miami to lay down new roots. But would you ever think sushi would be his craft of choice? Fernando Chang did. And over night, he became a rising success, sharpening his tools at Thai Treat, and then at his own, 26 Sushi & Tapas and Nisei. But these roots are now ready to grow, so Chang is opening his own ingredient-driven sushi concept, Itame, featuring the classics such as nigari, sashimi, and specialty maki, as well as Peruvian elements including guava and aji amarillo. We all love Asian-fusion cuisine, but what about re-imagining it with native Miami homegrown ingredients? This Miami-born chef, Andrew Zarzosa, did just that by taking learned recipes from cross border travels and bringing them home to Miami Beach. With a notable resume including the Fairmont in Jakarta and the Shangri-La in Malaysia and Philippines, Zarzosa offers Miami locals a passageway to his intriguing journeys serving vibrant hot dishes that are just as radiant on the plate as they are on the tongue. Try the foie gras dumplings, fried chicken mantou, or the curry laksa noodle bowl—a nod to Zarzosa’s travels that can now be yours too. Best friends since high school, Daniel Gonzalez, Jaime Villanueva, and Carlos Padilla had a childhood dream of opening a taco and ceviche shop—they may have even written it in the back of their high school yearbooks. Decades later, after working at top Miami restaurants including Vagabond Bar, Dragonfly Izakaya and Fish Market, and the BLT Prime Restaurant, their longtime vision finally came to life. With a menu honoring Miami’s diverse cultural scene—including Peruvian-influenced ceviche and Argentinean-inspired tacos—Hot Lime will spice up your taste buds with zing, zest, and pizazz. Making its rounds through Miami Farmer’s Markets since 2015, this organic and all natural smoothie and acai super spot is finally planting down its seeds. With a lineup that includes cold pressed juices, salads, and acai bowls, this healthy hot spot will be sure to make it to the top of your new favorites list. We recommend trying the super green power smoothie with kale and spinach or the super hero acai bowl blended with berries, coconut milk, and spirulina, topped with granola, fresh fruits, and exotic sprinkles of chia seeds, hemp hearts, flax seeds, cocoa nibs, and bee pollen. Looking for Miami’s Little Italy? We found it. Italian natives Massimo and Elisabetta Tundo relocated to Miami in 2004 with one mission: to supply Floridians with fresh, homemade pasta. And of course, they did—even winning a Sofi Silver Award for their truffle noodle, a signature dish on their new menu at Dal Plin. This novice gourmet bottega, a true homage to grandma’s Italian kitchen, is a recipe box of secret ingredients. Inside, you’ll find boiling pots of ricotta gnocchi with butter poached lobster, zucchini, and saffron sauce, but we recommend trying the fresh bucatini cacio and pepe or egg yolks handmade ravioli with fresh white truffle.